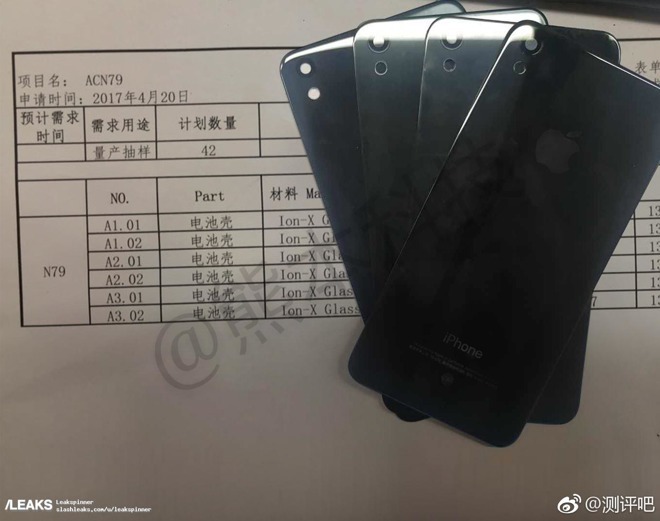 An image leaked on Wednesday appears to depict rear shells for an upcoming iPhone, using Ion-X glass —the same material found in the displays of non-sapphire Apple Watches. The phone is identified only as "N79" in a sheet behind the shells, which were shared on Slashleaks. The NXX format is known to be used in iPhone codenames. While the person who submitted the image suggested the parts are for an updated iPhone SE, that's unlikely. Apple refreshed the SE in March —boosting storage options to 32 and 128 gigabytes —and the company is only thought to be working on three phones for this fall, including the OLED-based "iPhone 8" and two LCD-based "iPhone 7s" models. A glass back would be consistent with some rumors about those products. It could be that the shells are for the 4.7-inch "7s," since they lack holes for a second camera lens, something expected on both the 5.8-inch "iPhone 8" and 5.5-inch "7s Plus." Notably there doesn't appear to be a camera bump, something found on every iPhone since the iPhone 6. The leak lacks any measurements, so it's impossible to say what the exact size of the part is based on the picture. Apple's iPhone SE is its smallest handset, with a screen that measures 4 inches diagonally. Another factor raising doubts on the leak's authenticity is that on one of the shells, the cutout for the Apple logo is misaligned. If not a fake, it could be that the part is a factory reject. The "iPhone 7s" line is expected to share some of the features of the "iPhone 8" —like wireless charging, faster wired charging, and/or an "A11" processor —but hold on to some iPhone 7 technologies, including not just LCD but the use of a physical home button instead of a virtual one. "7s" models will likely ship in September, possibly as much as a month or more before the "iPhone 8." Though the rear shell clearly says "iPhone," it is worth noting that Apple's iPod touch —which, like the iPhone SE, features a 4-inch display —has not been updated since July of 2015. While the iOS media player lineup is largely seen as outgoing, the most recent updates have arrived every two years, with the last refresh prior to 2015 arriving in May of 2013. Considering Slashleaks suggested the leaked part is for a 4-inch device, an iPhone SE update is not expected anytime soon, and the component sports a flat back without a protruding camera lens, the timing of a potential iPod touch refresh may not be coincidental. Of course, since the part specifically says "iPhone," such idle speculation may ultimately prove meaningless —especially if the leaked part is, in fact, a forgery. Regardless, Wednesday's leak is curious given the state of upcoming Apple product rumors, and is presented by AppleInsider for the purposes of discussion.